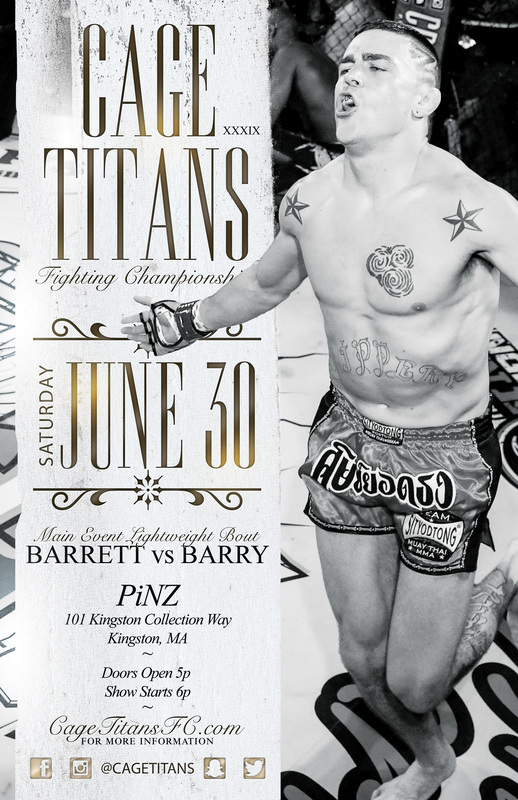 Cage Titans is excited to announce that the next event will take place on Saturday, June 30th at Pinz inside the Kingston Collection. This will be the first time since 2012 that Cage Titans has held an event outside of their home venue of Plymouth Memorial Hall but you can rest assured that your going to get everything you know and love from the brand in terms of the fights with the addition of a new, fun and unique experience at Pinz. In the Main Event, fan favorite ‘Slippery Pete’ Peter Barrett will take on rising prospect Connor ‘Bareknuckle’ Barry. Barry (4-2) is coming in off a dominate victory in his Cage Titans debut back in January when it took him just 1:01 to dispatch gritty veteran Jay Ellis. In a case of ‘Anything you can do, I can do better’ Barrett (9-2) finished that same opponent, Ellis, in just :52 last event back in April. Needless to say, both fighters are proven finishers and they will both be looking to make a statement in this match-up and stake a claim to being one of the best lightweights in New England. In addition to the Main Event, a champion verse champion showdown is set to take place when Women’s AM Flyweight Champ Kylie O’Hearn moves up to Bantamweight to challenge Champion Taylor Thompson. These are two of the most feared women fighting locally and neither are afraid to stand center cage and slug it out. This fight is everything you love about the sport of MMA, the best taking on the best, and has Fight of the Night, if not the Year, written all over it. 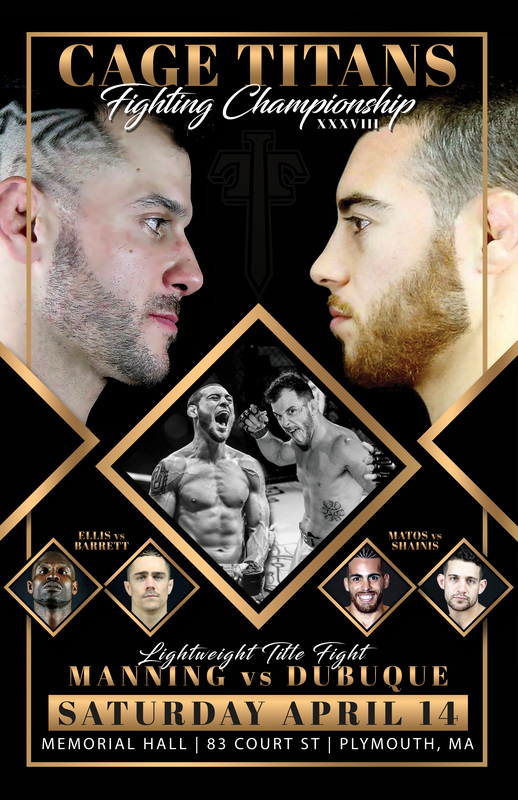 The other two fights on the Main Card feature Zach DiSabatino, who is looking to keep his undefeated record intact, taking on 90+ pro fight veteran Jay Ellis and the long awaited professional debut of Randy Costa who faces-off with Stacey Anderson. As for the Undercard, like always, it will be stacked with a wide variety of hungry, up and coming, amateur fighters just getting their starts in the sport as well as some other established amateurs looking to position themselves higher in the rankings with hopes of earning an amateur title shot. 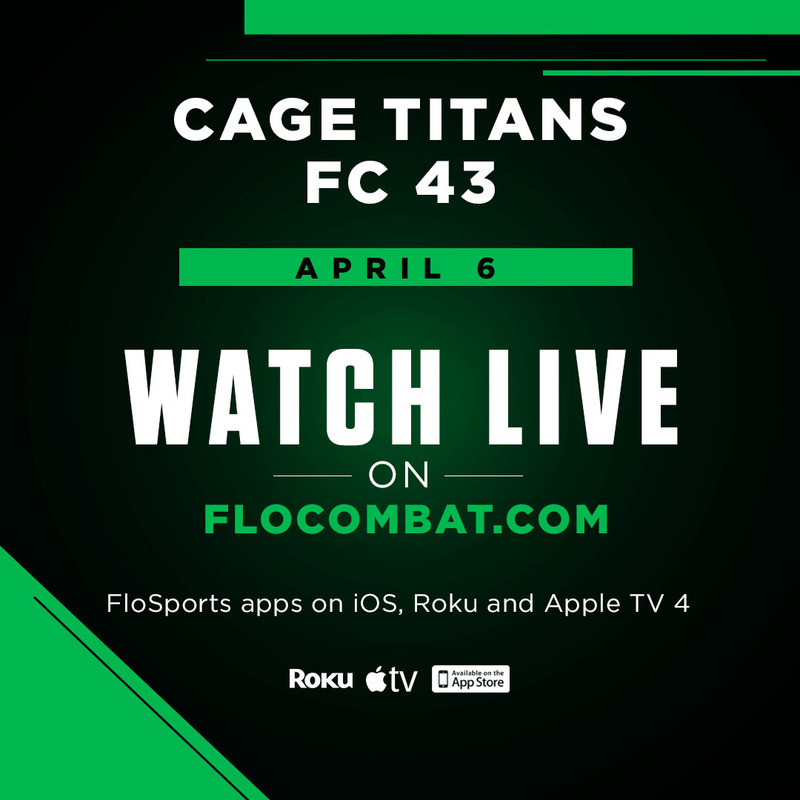 Be sure to follow along on the Cage Titans Fan Page for many more fight announcements as well as specific match-up highlights, new fights added to the card and fighter interviews, each and every day leading up the event. On Saturday, April 14th at Plymouth Memorial Hall, Cage Titans is looking to follow up on what has been an amazing start to 2018, a sold out event in January and two fighters making it to the UFC, with another stacked fight card. Headlining this epic night of fights, the Cage Titans’ Lightweight Title is on the line when Dan Dubuque takes on Jimmy ‘The Tooth’ Manning. Dubuque is one of the toughest fighters in New England and loves to take his opponents into deep waters where he tests their cardio, heart and will to win. As for Manning, he lives by the motto, “get in and get out” and has shown that so far in his professional career with all but one of his victories coming via first round stoppage. With two very contrasting approaches, something is going to have to give when these two meet and only time will tell who’s gameplan will prevail and who will be leaving with the belt around their waist. In addition to the Main Event, three amateur title fights really take the spotlight on this Main Card. First up, John Lessard and Mitch Raposo face-off for the vacant Flyweight Title. Lessard was in a bit of a waiting game, with teammate Jake Kasperowski holding the belt, but that all changed when Kasperowski decided to vacate in order to give him his time to shine. As for Raposo, he burst onto the scene last year, rattling off 3 victories in 3 tries, and didn’t care who stood in the way between him and the 125lb title. Since this fight was made, these two have been going at it, first inside the cage following Raposo’s latest victory and call out for a shot at the belt as well as all over social media…The disdain is real between these two and what better way to settle than over the course of 5 rounds! Next up, the Banatamweight Championship is on the line when the aforementioned Jake Kasperowski battles William Smith. Kasperowski has set high goals for himself and looks to capture his second belt, in hopes of positioning himself as one of Cage Titans’ most decorated amateurs being a multi-division champion. As for Smith, a champion in an other promotion, this is his second chance at a Cage Titans title and his sites are set on capturing the belt that alluded him almost 3 years ago in his first opportunity. And finally, Marty Navis and Trevor Gudde throw down once again but this time with the Welterweight Title as the prize. These two faced off in a memorable back and forth battle back in June of 2017, with Gudde pulling out the close decision, and with champion Bobby Gasdia on the sidelines, this was the bout to make in order for someone new to stake the claim as the best in New England. If you were witness to their first fight, you can only imagine the excitement we have in anticipation of seeing these two go at it again, but this time for 5 rounds. Multiple Fight Night awards between the two of them, two of the best at their weight class and a new belt up for grabs…What more could you ask for! The rest of the Main Card features 8 other professional match-ups with many of the faces you have come to expect and love from Cage Titans, as well as an exciting new one, Kin Moy, who is eager to put on a show for the fans at Plymouth Memorial Hall. As for the Undercard, like always, it will be stacked with a wide variety of hungry, up and coming, amateur fighters just getting their starts in the sport as well as some other established amateurs looking to position themselves higher in the rankings with hopes of earning an amateur title shot. 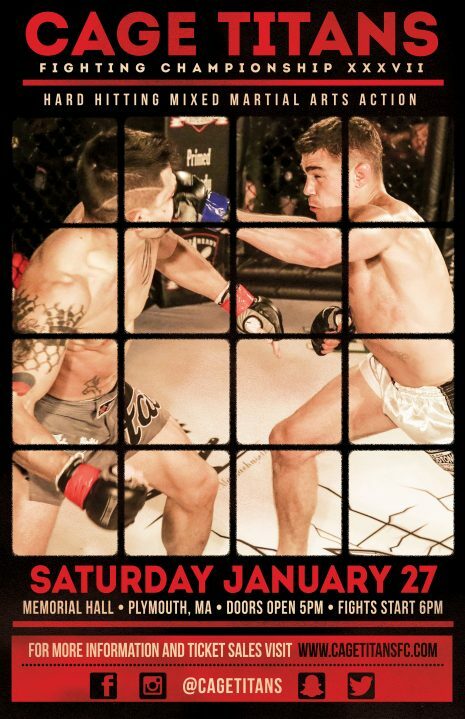 On Saturday, January 27th at Plymouth Memorial Hall, Cage Titans kicks off 2018 with a bang, hosting quite possibly the biggest fight ever to take place under the banner, when #1 ranked bantamweight Manny Bermudez (10-0) takes on his toughest test to date in Detroit’s Mike Hernandez (11-4). Bermudez is a well-known finish machine taking out 8 of his 10 opponents in the very first round and looks to add another victim to his resume with hopes that one more decisive victory will punch his ticket to the UFC. As for Hernandez, he is a juggernaut of a fighter with heavy hands, ending 8 of his 11 victories via TKO/KO, and plans on knocking the hype-train right off the tracks, catapulting himself to the top of the rankings. In the Co-Main Event, Florida’s Avery ‘The Irish Hurricane’ McPhatter travels up to Massachusetts once again to take on ‘The Unpredictable One’ Sean Lally. This is a rematch of one of the most talked about fights of 2017 and since 3 rounds wasn’t enough, this time it will be a 5 round affair for the vacant Middleweight Title. Lally picked up the somewhat controversial decision in their first go-round but both men have said to leave the judges at home this time, because they plan on ending the fight decisively so that there are no doubts as to who the better man is and who is deserving of leaving with the title belt around their waist. Also on tap, two amateur titles will be up for grabs when two current champions both go up a weight class in hopes of becoming multi-division champs. First up, female flyweight champion Kylie O’Hearn challenges Taylor Thompson for the vacant bantamweight title. This match-up has Fight of the Night written all over it as both these ladies are known for standing center cage and slugging it out. Next up, newly crowned featherweight champ Chris Sniger takes on 2017 KO of the Year recipient Chris ‘The Bearded Dragon’ O’Brien for the lightweight belt. These two fighters are flat-out ‘Must See’, collecting Fight Night Awards every time they step into the cage, and this fight promises to be one that will be talked about for a long time. As always the Undercard will be stacked with a wide variety of hungry, up and coming, amateur fighters just getting their starts in the sport as well as established amateurs looking to position themselves higher in the rankings with hopes of earning an amateur title shot. One match in particular to keep an eye on will be a number one contender fight between Mitch Raposo and William Graustuck, where the winner will be awarded a flyweight title shot against champion Jake Kasperowski next event. 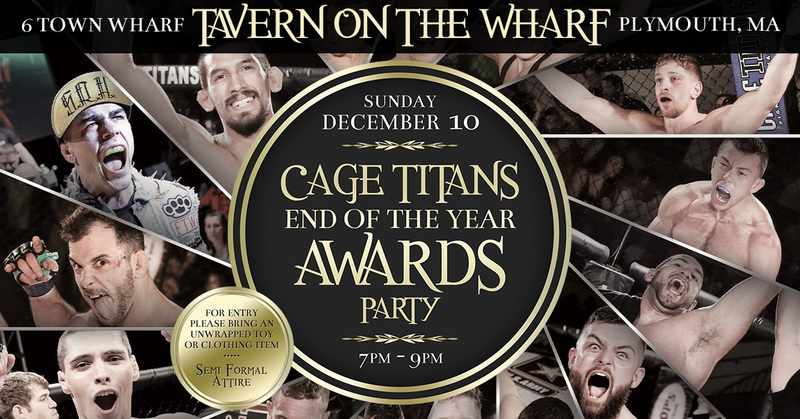 Please join us for the Cage Titans End of the Year Awards Party at Tavern on the Wharf, Sunday, December 10th from 7p to 9p. This is an open invite so family, friends and fans are all are welcome…The more the merrier! We look forward to seeing you there as we close out an amazing 2017! 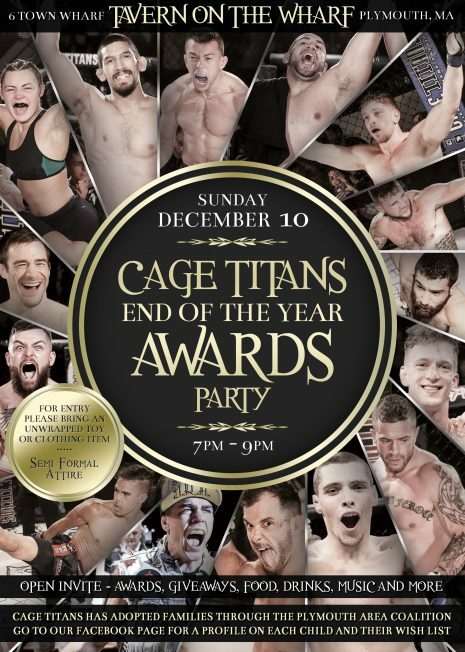 Be sure to follow along on the Cage Titans Fan Page for all up to date information surrounding the event, including how to donate, nominee videos, voting and more. 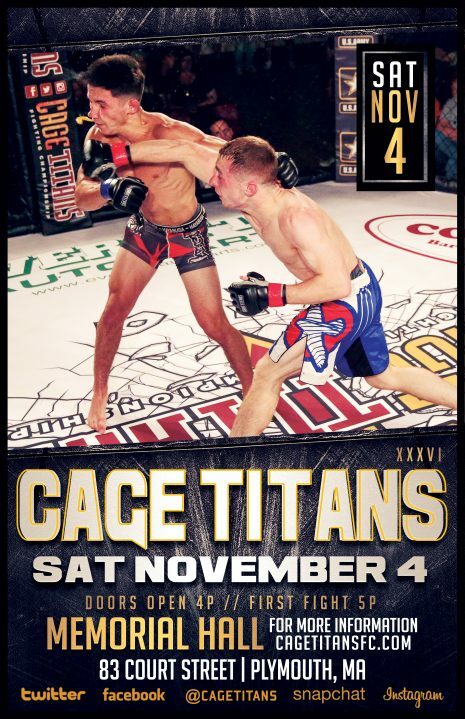 Cage Titans returns to Plymouth Memorial Hall for its last event of 2017 on Saturday, November 4th. In the Main Event, Cage Titans staple, Johnny ‘Cupcakes’ Campbell battles undefeated New Yorker ‘Ruthless’ Josh Ricci. Campbell steps inside the Cage Titans cage for a record 19th time and will look to cap off the year with a perfect 5 fights and 5 victories. Standing in his way though is arguably one of his toughest test to date in Ricci, who has yet to taste defeat so far in his professional career. This is a tale of two completely different style fighters, Campbell the high-energy, creative striker and Ricci, the hard nosed, grinding-style wrestler, and who comes away victorious will simply come down to who can impose their will on the other and where this fight takes place, either on the ground in favor of Ricci or on the feet in favor of Campbell. Cage Titans fan-favorite, “Slippery Pete” Peter Barrett returns to action to take on Arkansas’ “Downtown” TJ Brown in the co-main event of the evening. Barrett has gained popularity for his ‘go for broke’ style of fighting, while always hunting for the finish, and it shows in his record with 7 out of his 8 victories coming via finish and 5 of them within the first round. Standing across from Barrett though will be an opponent almost his equal in terms of fighting style, and that is Brown. Brown is the epitome of that ‘kill or be killed’ style and he has only been to a decision twice over the course of his 14 professional bouts, 9 of those being victories and 8 of them coming by finish. In an other highly anticipate match-up on the Main Card, undefeated Joe Giannetti takes on Connor Barry. This is a fight that has been talked about dating back to when both were amateurs and it was only a matter of time before they got to settle who was the better fighter inside the cage. Since turning pro only a year ago, Giannetti has quickly made a name for himself as a rising star by racking up an unblemished 6-0 record, finishing 5 out of his 6 fights by submission, 4 of which withn the first round. Not to be outdone, the extremely well-rounded Barry is another highly touted prospect, with the ability to finish fights equally either on the ground or the feet, and is looking to continue his climb through the local rankings with an impressive win here. As always the Undercard will be stacked with a wide variety of hungry, up and coming, amateur fighters just getting their starts in the sport as well as established amateurs looking to position themselves higher in the rankings with hopes of earning an amateur title shot. Two match-ups in particular to keep an eye on will be Trevor Gudde vs Brandon Murphy and Marty Navis vs Alfredo Nunes as both of these fights are taking place in the welterweight division and all 4 of these competitors are hoping with an impressive performance that they will be next in line for a shot at the 170lb title.